Ca2.93Na0.07Co4Oy/x wt% K2CO3 (x = 0.00, 0.01, and 0.03) polycrystalline ceramics were prepared by conventional solid-state method. XRD results have shown that all samples predominantly include Ca3Co4O9 phase together with small amounts of secondary phases. SEM images show that all samples have randomly oriented plate-like grains in different sizes. The electrical resistivity measurement showed that electrical properties of Ca3Co4O9 ceramics can be improved significantly by both, Na doping and K addition at their optimal values. 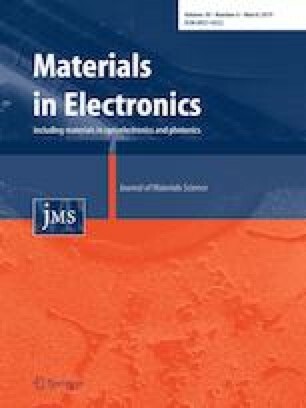 The effect of dopants on thermoelectric properties of Ca3Co4O9 was examined by both, Seebeck coefficient and power factor, being higher in K-added than in the pure samples, indicating that thermoelectric properties of samples are positively affected when alkaline elements enter into their structure. All samples have been prepared in the Material Preparation Laboratory in Tarsus University in Turkey. As XRD and SEM measurements have been made in the MEİTAM Central Laboratory in Mersin University, other measurements in this study have been made in the Laboratory of Instituto de Ciencia de Materiales de Aragón (CSIC-Universidad de Zaragoza). B. Özkurt and M.E. Aytekin are supported by the BAP Research Fund of Mersin University, Mersin, Turkey, under Grand Contracts No. 2018-3-TP3-3086. M.A. Madre, M.A. Torres, and A. Sotelo acknowledge the Spanish MINECO-FEDER (MAT2017-82183-C3-1-R), and the Gobierno de Aragón-FEDER (Research Group T 54-17R) for funding.